Tonight is Halloween. Abby is going to be a flapper and Eve is going to be grass. You know, the stuff that lawns are made of. Getting Abby's costume together was not too challenging -- mostly this required combing our collective closets for appropriate garments. It helped greatly that I had the perfect dress and that Abby already had a navy wool cloche. Our only purchase was a long string of pinkish pearls. Fortunately Outlet in Hiroo came through for us. Eve's costume, on the other hand, required some creative handiwork. Eve started with a length of fake grass purchased at the Cainz home center in Minakami. 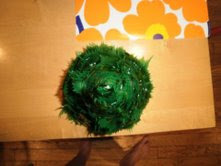 With Francia's help, Eve turned the pseudo-greenery into a cape and matching mini-skirt. There is even a square left over that will become Pippi's place mat in the country. Eve paired her custom garments with her "Green is the New Black" tee shirt and emerald tights, also procured at Outlet. (What would we do without Outlet?) I helped the cause by concocting Eve's head wear, pictured above and below. 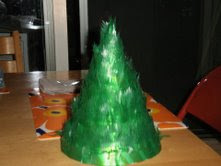 This entailed stapling strips of plastic sushi garnish together and affixing them in a spiral-ish pattern to a leftover party hat. Not bad. 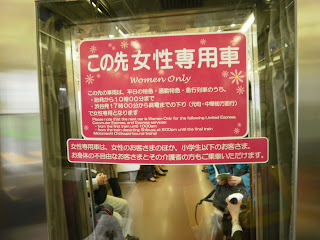 On a recent ride on the Toyoko Line, we had the pleasure of sitting in the “Women Only” subway car. This is the Tokyu Corporation’s answer to the groping problem that has reached epidemic proportions on Tokyo trains in recent years. I never had any personal experiences with groping but when we lived in Yutenji, many, many moons ago, I used to take the subway to school daily. The start of my journey overlapped with the end of said Toyoko Line (it connects Tokyo and Yokohama hence the name). My route entailed riding one stop, getting off the train, crossing the platform and switching to the Hibiya Line which was often empty since many of its trains originate at Nakameguro. By contrast, the Toyoko Line was usually loaded with commuters on their way to Shibuya and I often had to push my way on to the train. The technique was to enter backwards or sideways and just give everyone a gentle nudge. If all else failed, the famous, white-gloved conductors were on the platform to help out with an added shove. It is amazing how many bodies can squeeze into a subway car! When I first began commuting I carried a mikan (Mandarin orange) or two in my backpack. That is, until I wised up. You see, my segment on the Toyoko Line may have been short but the train was so packed that the skin of my mikan was ruptured, its juice oozing and the fruit no longer edible by the time I reached Todai. Imagine if subways in New York or Chicago were this crowded! I would never even consider riding them. During our recent transit, the train was not crowded enough to squish a mikan or even a mosquito. Nor were the passengers in such close proximity that groping might be a threat. Nonetheless, we three women could not resist the draw of a subway car just for us! Today I saw something I had never seen before. While walking along, I spied someone's garbage out on the street -- the usual carefully tied plastic bags waiting patiently at the curb for their appointed pick-up (OK, not quite). But on top of the bags was a toilet seat! In Tokyo I have seen some surprising stuff in the trash. But a toilet seat??? Never! I suppose toilet seats, like other no longer wanted households items, have to go someplace too. And in Japan, where the appetite for used things is minimal (vintage clothing is one notable exception) and homes do not have much storage, lots of those items end up in the rubbish bin. To handle the load, the city periodically collects "giant garbage" (sodai gomi). The morning before the round up, the street can become a veritable cornucopia of used goods. Electronic equipment, furniture, toys, pet carriers are all there for the clandestine taking -- this practice is frowned upon by the locals. Japan's propensity to discard stuff that still has life in it seems quite wasteful. And it is a little sad to see belongings that lived in someone's home relegated to the dump. I once read an article by someone who furnished his entire apartment from sodai gomi. I myself do not make it a habit to sift through other people's discards but there was that perfect set of wooden blocks I scarfed up for a friend's son and the dollhouse I stealthily picked up for Eve. Like the toilet seat, however, the vast majority really does belong in the trash and is best left alone. Today I saw the most beautiful wall. At the invitation of the architect, I had a chance to tour the new French Embassy before it is handed over to the client later this week. The wall I am about to describe encloses the main embassy building. Regrettably I changed bags, flew out of the house (I was a little behind schedule), and inadvertently forgot to take my camera. So no photo. So sorry. Maximizing the site's wooded interior, the building stands near the edge of the property line. Because of proximate neighbors, the architects all but enclosed the south side of the building (there are some windows but they are few and far between). I know this sounds counterintuitive, especially in Japan where the southern exposure is highly valued. The rationale is that shutting out the sun will yield lower cooling loads and cut costs for the embassy as well as preserve privacy for everybody. Created by a subcontractor out in Kofu, the wall itself is made of concrete panels dotted with stone aggregate: small brown pebbles, medium white limestone chips and large green chunks of granite. Before pouring the concrete, the manufacturer scattered the stones evenly on the bottom of a shallow metal mold. Then they slowly poured concrete on top, ever mindful of the distributed stones below. After curing, the contractor popped out the hardened panels and polished their molded undersides. As I listened to the architect's cogent explanation, I kept imagining baking metaphors. Though a whole lot more labor intensive than mixing up a batch of cookies, this process yields a very beautiful product. The other night, during our home Happy Hour, we enjoyed a selection of cheeses as we often do. On offer was Gorgonzola, a bit of Brie and a chunk of our locally made, Gunma Prefecture Edam. The Brie was a tad bit past its prime, but the others were quite tasty. We enjoyed them with a variety of crackers (carted up from Tokyo but European in origin) and beverages, including the local seltzer water which we deemed acceptable for country use but sub par for city consumption. I did not really like the idea of the Edam so I hesitated to buy and try it -- Japan does not exactly have a great cheese making tradition. Not to mention, I was slightly put off by its milky white color and, measuring only about 1.5 inches square, it seemed overly precious. In terms of flavor, I was not entirely disappointed. But the slightly processed texture suggests that Japanese farmers ought to stick to things they excel at, such as rice or tomatoes. The best part of this cheese was its accompanying, multi-functional tool. Totally blogalicious! I regret that I did not snap a photo of the package before we tucked in so you are just going to have to use your imagination. It consisted of twin, shrink-wrapped compartments: one for the cheese (which was swaddled with a secondary layer of plastic wrap to ensure freshness, I presume) and the other for a clear, plastic tool sealed in its own little cellophane pouch. The excessive wrapping was way beyond the call of duty and far from praiseworthy. 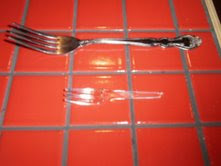 But this little tool, a mini fork-knife with tines at the end and a serrated edge on the side, was very clever. And if it actually works, cheese enthusiasts can cut and spear in one blow! Why didn’t I think of that? Oh, how I love Jinglish! The other day Eve spotted a new ice cream product in the frozen food section of the supermarket in Minakami. When she showed it to Abby and David they barely broke a smile. But Eve and I thought its name was hysterical. So tonight I just had to give this “dessert cup” a taste test run. While out walking Pippi, we stopped at our local Am-Pm convenience store for ice cream, as we are sometimes known to do. The rest of the family opted for conventional Haagen Dazs. I wasn’t going to indulge but then Googeous came into view and my resistance melted away. Naturally we speculated about the etymology of “Googeous” and its possible meanings. Loosely translated as “over the top,” or something to that effect, the English word “gorgeous” has made its way into Japanese. I wondered whether ‘googeous’ was a transliteration of the Japanese version of ‘gorgeous’ but no go: the fine print on the carton includes ‘googeous’ written clearly as such in Katakana. Perhaps it was a misspelling that simply took on a life of its own? I can just imagine the focus group goings on. ('Googeous' ga ichiban! Yappari 'Googeous'!) One of the most common methods of Japanizing English is to simply lop off word endings, as in “pasacon” (= personal computer). Perhaps substituting an "o" for an "r" was a new variation on that theme. Coming at it from another direction, I considered the target consumer. It is obvious that this frozen confection and its complex flavor are aimed at the sophisticated palette. Whatever its origin, Googeous definitely delivers in the nomenclature department. 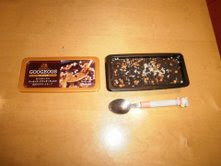 But when it comes to taste, I must admit, Haagen Dazs Bitter Caramel has got Morinaga licked. The other day Eve and I were driving along Nisseki Dori when we spotted this pair of pink, bow-bedecked booties pounding the pavement. Thanks to Eve's superior espionage skills -- this photo was taken from the window of a moving car -- we were able to document our find for posterity. Please note that Eve and I have a bit of a footwear fetish. Our eyes always gravitate towards shoes, taking in heel height, toe shape, color and any unusual details. And we have a habit of pointing out particularly outstanding and outlandish footwear to each other, sometimes at the expense of our usually excellent manners. Imagine our pure delight when these came into view! A country where shoes are generally removed before entering the home and even some work places, Japan not only authors some mighty fine footwear, it also tolerates fashion statements of all sorts, no matter how egregious. This is particularly true of shoes since they are often not seen, except outside. Some fashionistas attempt to coordinate their costumes with matching colors or styles, sometimes going overboard as in the lady dressed in rainbow garments from top to toe that we sighted recently. But many take a far more free-form approach by considering each part of the body and its clothing as a separate, sartorial statement. Juxtaposition alone does not justify coordination. The other day Abby and I went to see what proved to be a very painful movie. It was about a sixth grade class that raises a pig at school and then has to decide whether to bequeath the class pet to the third grade or turn her into pork chops by sending her to the “meat center” (aka slaughter house). Before coming to a conclusion, many class votes ensue, each one recorded on the blackboard with a series of tally marks. But not the conventional US four verticals followed by that resounding, diagonal slash. Japan also uses a series of lines to count groups of five but arranges them in the order of the character commonly read as tadashi and translated as “correct” in this context. Learned in first grade, this 5-stroke kanji is one of the easiest and most logical to write – all Japanese characters must be written with the correct stroke order or else! Ironically, teachers often use this tally system to keep track of bad behavior by marking each digression on the blackboard with a correctly ordered, chalk stroke. One of the boys in Eve’s class had the dubious distinction of twelve full “tadashis” in one class alone! Now back to the movie. Towards the end of the film, after months, weeks and days of heated discussions, the class decided to vote one last time. Tear-stained, traumatized and tormented, they agreed beforehand that this would be their final resolution. Slowly, slowly those tally marks were recorded on the board, the vote swinging first in one direction and then in the other. Unsurprisingly, the result was a tie. This left the ultimate and deciding vote in the hands of sensei. Uh-oh. Let’s just say the director did not go for the Hollywood ending. I suppose the sign of a “good” movie is one that makes you think, emote and ponder your own actions. As far as we were concerned, the movie was preaching to the converted. Hopefully it will persuade others to think first and eat second. This time of year I make it my business to eat kaki, or persimmon, on a daily basis. I also like to keep them in a bowl (preferably one of the blue ceramic ones) on our dining table. I simply love their deep orange color. And their squarish shape appeals both to the eye and the hand. But the the teeny, tiny kaki pictured above is in a class of its own. As you can see, this mini-persimmon is barely bigger than a one Yen coin! I found it lying on the ground near a friend's home. I had never seen a persimmon this small so I relocated it to my kitchen counter where we all enjoyed its cuteness until rot set in after about a week. The kaki season is not that long, roughly the end of September through the end of November. I prefer the flat-bottomed type and like to eat them when their flesh is a bit crunchy and that lovely pale orange color. I try to pare away the peel in one go (I am pretty good at this) and then cut the fruit into eight wedge-shaped pieces. I spear each piece with a toothpick (or use my fingers if I am feeling particularly lazy). Some varieties have big pips but I do not like their flavor as much and navigating around the seeds is a bother. Ichi-Fuji, Ni-Taka, San-Nasubi (= Mount Fuji, Eagles and Eggplants). What could these three possibly have in common? On the surface I would say not much. But today I picked up a handy bit of information. In Japan, the dream you have on the night of January 1 is an indicator of how lucky your new year will be. During the Edo Period, the #1 all-time best dream topic was Mount Fuji, followed by eagles and, pulling up the rear, eggplant. It is easy to understand why dreaming of Mount Fuji might bring good luck. Even eagles -- those impressive, if somewhat scary looking, birds fit the bill (especially if you happen to be an ornithologist). But eggplant??? I love eggplant. They are beautiful and can be eaten in lots of delicious ways. But I never thought that a purple vegetable had the power to portend the future. Apparently eggplants are farmed in Shizuoka Prefecture. And Shizuoka Prefecture, formerly known as Suruga, was the home of shogun Tokugawa Ieyasu, hence the association between good luck and a good, locally grown crop. The other day I spotted this gem in the Oedo Line while coming home from the gym in Sendagaya. It asks, "Have you thought about your grave?" Well, perhaps riding the subway IS a good time to face facts and consider this weighty question. In New York City subways, signs advertise tattoo removal, torn ear lobe repair, breast implants and PI lawyers. But Tokyo train ads promote wholesome offerings such as English schools, wedding venues, and antidotes to every seasonal malady -- colds in winter, allergies in spring and energy pick-me-ups all year long. A careful composition of black and white (hidden message) with pink accents (uplifting), gold lettering (timeless) and an image of Buddhist statuary (serenity), this one features the sale of burial plots. Tours available! I wonder how many people choose their final resting place from a subway signboard ??? This is a picture of a parking lot that was until recently the Azabu Juban Onsen (a public bath supposedly supplied with hot spring water). Though I did not frequent this bath, I enjoyed seeing locals laden with their washing supplies on their way to or from a nice soak. The scene hearkened back to an earlier time when this neighborhood was a charming, residential enclave and untainted by the rampant redevelopment that is turning its shoe-makers and bread bakeries into trendy snack shops and nail parlors faster than you can say "French tips, please." But in Japan few buildings are sacred. And parking lots are just construction sites waiting to happen. Summer's dog days of may be over but in Azabu every day is dog day! There are so many dogs in this neighborhood! Labs, Goldens, Shibas, Dachshunds (long as well as short hair varieties), poodles and every type of "tea cup" pooch known to humankind. You name it ... we got it. When we went to the ward office to register our dog, Pippi, we received a pamphlet about the proper way to walk one's dog. Here are some of the choice tidbits we gleaned. If you encounter another dog, always ask the owner first if it OK for your dog to "say hello" (let's practice .... "Ii desu ka?" "Hai, ii desu" or "Dame desu" -- both are plausible responses), always keep your dog on its leash (the equivalent of holding hands) and ALWAYS carry "etiquette water" to splash down any unsightly puddles. After all, the city is not the dog's toilet! I have had the pleasure of strolling around town with new born babies and my puppy. Passersby barely bat an eye at a human baby. But a baby dog? Irresistible! When Pippi was little, well-heeled ladies often stooped down to give her a little pat and happily let her lick the make up right off their faces. Eve and I spotted this little Chihuahua outside one of our neighborhood supermarkets. Isn't he/she a looker? When the kinmokusei (aka osmanthus) come out, it is a sure sign that autumn has arrived in Japan. These tiny golden flowers that grow on trees and bushes make their annual appearance once the humidity and hot weather go. Visually unimpressive, the benign little blossoms are easy to miss. For years I passed kinmokusei trees in my neighborhood without ever seeing them. But their smell is another matter. Once I asked one of my Japanese teachers the name of this mysterious plant and she responded by asking: "Do you mean the flowers that smell like toilet bowl cleaner?" She hit the nail the on the head! That was the smell! I learned subsequently that kinmokusei used to be placed in bathrooms to mask the odors. Naruhodo. Yesterday was Abby's birthday. I can not believe that my little girl is 15! How did that happen? Naturally I get rather nostalgic each year at this time. It was 15 years ago yesterday that I became a mother for the first time. Birthing my big baby girl at St. Luke's was definitely a novel experience for me but perhaps the most profound aspect of Abby's arrival was our return home. I remember taking Abby on a tour of our apartment in Nanpeidai to acquaint her with her new home. Aside from flowers on almost every horizontal surface, the apartment looked pretty much as I had left it 7 days earlier (Yes! Seven day hospital stays are routine for first time moms in Japan). But I was a completely changed person in the most wonderful way. Over the past 20 years I have been to Kyoto countless times. But yesterday I saw an entirely new side of the city. Literally. I always associate Kyoto with its carefully laid out gardens and temple precincts or the cross-hatched street grid comprising its central core. 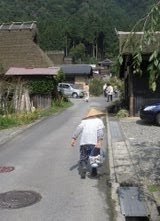 This time I went to the far reaches of its northern edge to visit two, rural hamlets, Miyama and Koshihata, that are parts of the city physically but not in spirit. The purpose of my trip was to see two textile artists, one an expert in aizome dying, and the other a master weaver who works with wool (yes! ), silk and kasuri dying, albeit rendered with a paint brush and artificial, chemical tints. Both bed down in idyllic settings but the scenery en route left an equally indelible impression on me. Though traveling by car was the only way to go, the very thought of the drive makes me queasy -- my stomach definitely has a memory of its own. Due to the curving, mountain roads, I was practically in a constant state of nausea. I tried to distract myself by gazing out at the orderly rows of Kitayamasugi (cedar) trees. Covering the sloping ground planes, the slender, many meter-high trees are leaf-free, except for plumes of greenery on top, the only parts to see the sun on a regular basis. Because of the trees’ density, only a few rays filter down through the thick forest, resulting in a mysterious, shadowy landscape accented with stripes of sunshine. 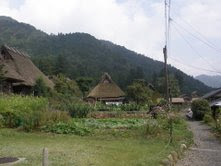 My efforts and gaman were rewarded by views of the charming cluster of thatch-roofed houses nestled among the hills of Miyama. This small community still belongs to the farming families who live in its 250-year-old timber houses with their Kitayamagata irimoya roofs built to shelter trays of silk worms above and humans plus their livestock below. Made of thick thatch, the roofs are bedecked with bright green moss on their northern faces while their sun-kissed, southern exposures remain a lovely golden brown. In between the houses were neatly planted rows of sweet potatoes, tomatoes, eggplants and other vegetables. I even spied awa, a rice substitute once eaten by impoverished rice growers who could not afford to consume their own produce. 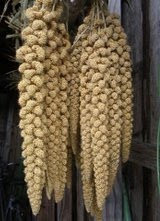 Today the grain has become so scarce that it is now a very expensive delicacy! 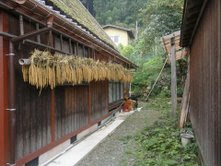 We then hopped back in the car and took a single-lane kokudo (national road), barely wide enough for our sedan, through the mountains to visit the master weaver. He lives in an old minka farmhouse, beautifully appointed with antique tools and carefully chosen furniture. The big table and chairs in his farm kitchen are clearly the heart of the house. A short drive away, his studio occupies a converted greenhouse. He needs plenty of daylight to get the dye colors just right. Yesterday he had a series of wool skeins dyed in a spectrum of colors that were hanging out to dry. 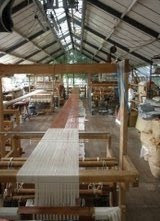 But the most spectacular sight was the obi he is weaving – the silk warp threads stretch the entire length of the room! Before he weaves in the weft, the artist paints the silk by hand with an array of autumnal colors. He is preparing for a show at an Aoyama kimono shop in November. I am eager to see the finished product.